The series begins with a young monkey-tailed boy named Goku befriending a teenage girl named Bulma. Together, they go on a quest to find the seven Dragon Balls. Goku later undergoes rigorous training regimes and educational programs under the martial artist Master Roshi in order to fight in the World Martial Arts Tournament, a competition involving the most powerful fighters in the world. 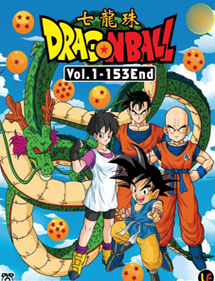 During his training time with Roshi, he meets a bald Shaolin monk named Krillin, who starts out as Goku's rival classmate; however, they soon become best friends. Outside the tournaments, Goku faces diverse villains such as Emperor Pilaf, the Red Ribbon Army, and the Namekian King Piccolo. Several of the enemies and rivals Goku encounters eventually become his allies and close friends, including the desert bandit Yamcha, the assassin Tien Shinhan, the samurai Yajirobe, and King Piccolo's offspring/reincarnation Piccolo Jr.